When looking through my cookbooks I am surprised I had never written about this book. I love this cookbook. This is the photographic edition of Mark Bittman’s How to Cook: The Basics. I have two other Bittman cookbooks largely because of how much I adored this one. I don’t know if I’ll get around to those for a long time. This is a fantastic cookbook for someone starting out to cook for the first. Even an intermediate home cook will find it useful because he gives loads of variations in each recipe to alter it. I’ve used more recipes and tips from this cookbook than any other. It is extremely handy and helpful. Maybe not the best ever recipes for certain things, but practical and still good. There are sections for vegetables, meat, seafood, and there’s a section on beans. 2016 is the year of the pulses so that is appropriate. Prose and Writing: Concise. Strong. Easy to read. This befits a writer from the New York Times. Good for learning. Photography and Layout: Not fancy, but to the point. I really like the layout as there were over 1000 photos in this book. It was all arranged well on the page. Other Book Notes: This book is heavy, but no means my heaviest cookbook. I really like it though and it’s one of the first cookbooks I go to when I want to do something classic or standard. Usefulness Factor: 5/5. This book has recipes for all your basics and for big family meals and entertaining. Inspiration Factor: 4/5. While nothing fancy, the variations to the recipe give you a ton of ideas for the future. Recipes Tested: Lots: Granola and Muesli, Cinnamon rolls, Chicken Stock, Minestrone soup, Vinaigrette in Jar, Tomato Soup, Garlicky White Bean Soup, Bean Burgers, Roast Chicken, Grill Cheese Sandwich, No Knead Bread (not from this book exactly from other Mark Bittman resources), Coconut Layer Cake (for reference of other cake). Bring a stockpot of water to a boil and salt it. Heat the oven to 200F and put a large oven proof bowl in it for about 5 mins. When the bowl is warm–handle it with oven mitts to avoid burning yourself–crack the eggs on a flat surface and open them into it. Beat them with a fork or whisk until uniformly coloured. Then stir in the cheese. 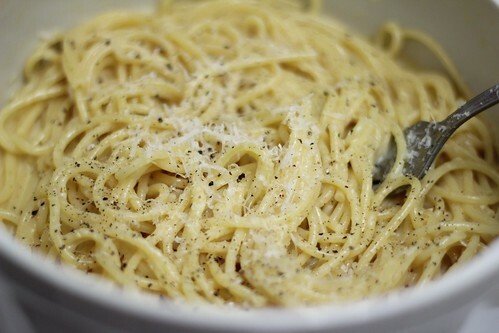 When the water boils, cook the pasta until it is tender but not mushy: start tasting after 5 minutes. When it’s done, scoop out the reserve at least 1 cup of the cooking water, then drain the pasta. Immediately toss the pasta with the eggs in the bowl; if it’s too dry (unlikely), add a little of the pasta-cooking water. Taste and add more salt or cheese if you want, then add black pepper–I suggest a lot–and serve. Notes: I made it for one person by using one egg and less than 150g of pasta. I liked the flavour and simplicity of it. A couple of quibbles. 200F not warm enough. I would raise the temperature and put it in while the pasta is cooking. I did not need the pasta water. I used a lot of parmesan. Yum. Hi Jessica! I think more people should review cookbooks like us. It’s my own personal challenge since I’ve become addicted to collecting cookbooks. More to come from me and hopefully from you too. 🙂 Thanks!